LAMINATE: Place the card directly into the EasyIDea™ ID card Pouch Laminator included in your Complete ID Card Kit. In seconds, you will have durable, waterproof, borderless ID cards that look and feel like professionally printed PVC cards! Printing ID cards from your home or office is a great way to save money on your ID printing needs. 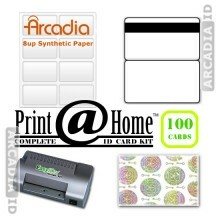 You can order a complete ID card kit that will include all that you need to create PVC quality ID badges using your home printer. You will be able to print out your IDs using your custom laser or inkjet printer by using the custom synthetic Teslin or Artisyn sheets that are provided in your kit. To design your ID cards you can use one of the premade ID templates that is available at IDCreator.com. You may also choose to use your own software program or Adobe Photoshop or Microsoft Word. Once you have designed and printed your ID cards you will then want to laminate them. To do this you will place the ID badge into one of the butterfly pouches that is provided. Once inside the butterfly pouch you will then send it through the laminator. Once it has been through the laminator you are left with an ID that is high quality and professional looking. It is really just that easy to print your own ID cards from the home or office using a regular standard printer. You will receive all of the items that you need inside your complete ID kit. Choose the type of paper, type of butterfly pouch, and the laminator that you want and we will have it shipped out to you right away. If you have any questions regarding any of the items that are included in a complete ID card kit or if you need help customizing your ID card kit you can contact us by phone at 855-MAKE-IDS (855-625-3437) or through email at [email protected]. You may also find the information that you are looking for on our website Arcadia.com. Save 5% when you purchase a Complete Kit! Save 15% when you purchase a Complete Kit!